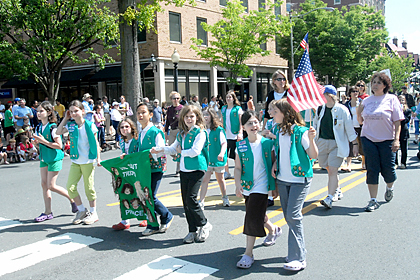 SCOUTS ON PARADE: Princetons Girl Scout troops enhanced Saturdays Memorial Day parade. Among the three dozen other groups marching were area Boy Scouts, the MacGregor Pipe Band, the Colonial Musketeer Fife & Drum Corps, Little League and Girls Softball Association teams, and a patriotic bike brigade for Princeton school youngsters. The Princeton Regional School Board ratified the proposed terms of a 2008-2011 collective bargaining agreement with the Princeton Regional Education Association (PREA) by a unanimous vote at its meeting last Tuesday. The PREA had ratified the terms of the settlement earlier in the day. Princeton Borough Council met last night (after Town Topics press time) for another closed session discussion of negotiations between the Borough and its developer Nassau HKT Urban Renewal Associates, LLC. (NHKT). A permanent neighborhood exhibition, with the Witherspoon-Jackson Neighborhood Quilt as its centerpiece, will take a place of pride when the Arts Council of Princeton opens the doors of its newly renovated and expanded Paul Robeson Center for the Arts next Thursday. Kristin Haraldsdottir was born in Iceland, moved to Norway as a toddler, and ended up in Minnesota as a five-year-old. While her family has stayed in Minnesota as her father has practiced medicine at the Mayo Clinic, Haraldsdottir has maintained close ties to Iceland since most of her extended family still lives there. Despite her multi-cultural background, Haraldsdottir suffered culture shock when she came to Princeton University in 2004 as a prized recruit for the Tiger womens open rowing program. For Tarah Kirnan, the mission was clear as she began her senior year on the University of Pennsylvania womens lacrosse team. From the day we came in last September, our motto this year has been in it to win it, said Kirnan, a former Hun School standout and star defender for Penn. As they headed to Mercer County Park last Thursday for the state Group III Final Four, the Princeton High boys tennis team was hoping to spend a long day on the courts. The Little Tigers were starting the day by facing Millburn in the semifinals at 11 a.m. with the winner slated to advance to the championship match at 3 p.m.
PHS ended up going through a marathon, but not for the reasons it had hoped.